My appreciation for anyone trying to overcome a disability began way back in 1981, when I broke my neck while playing U16 Sussex County rugby. I knew nothing about correct diet or recovery and in addition to that, I was over-training. All the warning signs were there – but I ignored them. Luckily I had only temporary paralysis, but I needed surgery to re-attach my head to my neck! A Mr Brian Elliott, consultant orthopaedic surgeon, performed the Cloward procedure (surgery pioneered by a Dr Ralph Cloward at Pearl Harbour) and fused my C6/C7 cervical vertebrae. This brought an end to my rugby days. In the following weeks, I started reading books on exercise and physical therapy and began rehabilitating myself. This took months, and then years. I was not an academic before the injury, but had to become one now that sports were out – for a while anyway. I built my own home gym in my mother’s back garden, and set about turning my life around. At first, my choice of college subjects was selfish. I chose topics such as human biology, psychology and physical education, purely to help get myself back to some level of health, fitness and confidence. Having at first thought I would become a sports coach, I started a BA (Hons) Degree in Sports Studies/Science. Later, I realised I wanted to help others to help themselves. I chose to work as a Sports Activities Instructor for adults with learning disabilities: Down’s, Autism, Cerebral Palsy, etc. I completed a course with the American College of Sports Medicine (ACSM) and became a Certified Health and Fitness Instructor in Preventive and Rehabilitative Exercise Programming, and worked in a sports centre. Then, by chance, I discovered the work of “Cardiac Technicians” (as they were then called in the British National Health Service or NHS). At the same time, I needed more regular working hours, so started writing to every hospital in the country, hoping to get a permanent job at one of them. As this was during a recession, there were very few vacancies. In the end I was offered a place as a trainee (intern) at Conquest Hospital, Hastings. While at Conquest I was invited to help with the excellent Cardiac Rehabilitation Program there. I gave talks twice a month to groups of 20-30 heart patients, on the subject of Safe and Effective Exercise. My final year dissertation looked at the effectiveness of Conquest’s Cardiac Rehabilitation Program. One day I overheard two junior doctors discussing a patient they referred to as a “Cardiac Cripple”. 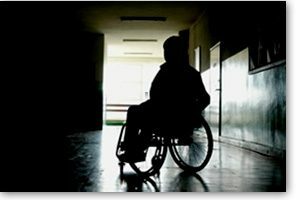 Having more respect and appreciation for anyone trying to overcome an illness or disability, I did not share these doctors’ belief that some people were just hopeless cases. And just for the fun of it, I started to ask myself “What would be the polar opposite of a Cardiac Cripple”? How about a “CARDIAC ATHLETE”? In 2001, together with Russ Bestley, I created the Cardiac Athletes “running man in heart” logo. I applied for a trademark for the logo, and it was granted on 18 April 2002. Together with Russ I decided to produce a newsletter and called it “The Association of Cardiac Athletes Newsletter” to try and bring this special group of people together. This was sponsored for a while by Medtronic. It proved popular, but as the internet was developing I realised that this would offer access to a wider audience, and so started to make enquiries into how a Cardiac Athletes website could be created. 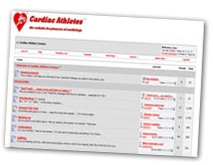 On 19 September 2001 the www.cardiacathletes.org.uk domain was first registered and on 21 September 2001 the Cardiac Athletes website went live for the first time. I started to receive emails from people all over the world, and realised I needed to create an online forum where people could talk to each other directly. I looked at a number of forum packages from various companies and chose the best that was available at that time. 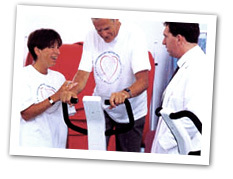 On 2 February 2006 the Cardiac Athletes Forum was launched. To help with advertising the existence of the site and at the same time raise some money to help me pay for the upkeep and development of the website, I added two free online shops, one in the USA and one in Europe. Members were beginning to offer to pay toward the continuation of the website, so I added a Donations page in March 2007. This now covered the running costs and any development costs of the site. But as there was beginning to be a ‘slush fund‘ left over I thought how best this could be used. I decided to put some of this money to one side with the hope of purchasing Automated External Defibrillators (AEDs) for sports centres. This move would be effectively ‘closing the circle’, in other word, heart patients saved by AEDs would be donating toward paying for more AEDs which would save more people’s lives. This makes sense and remains one of my key goals. It is shared by many of the members of this website. Some questions on the forum kept recurring, e.g. 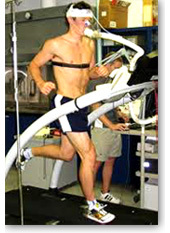 “What should be my Max Heart Rate?” – so in March and April 2007 I decided to add a number of online Calculation Tools so that people could do this simply and accurately for themselves. The forum package I purchased for the website turned out to be a very good one with many excellent features. One function I found very useful and informative for both myself and the members was the ability to add Survey Polls. This has already opened up some interesting areas for further research and investigation. As well as having extensive experience in all areas of cardiology including electrophysiology, echocardiography, angioplasty and resuscitation, in 2010 I was fortunate enough to be a member of the Cardiac Risk in the Young (CRY) team who screened the members of the 2012 British Olympic Team. In 2011 I moved to Victoria, Australia from the UK. Sadly the CA Forum was hacked in 2012 and took many months to fix. During this time members moved over to a Facebook group, which has grown rapidly and is now adding 3 to 5 new members every day. Finally, I have managed to move all the elements of this internet group into one local company and onto one server. The website you are now viewing is the latest in our evolution. But I have even more planned! There is still much to improve. Watch this space! In 2007 a number of members met up for the first time and ran together, some in relay teams, in the Akron Marathon, USA. This proved to be a very popular thing to do and so other meetings and sporting events have been arranged since then in the UK, USA and Australia. 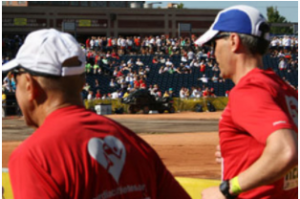 In 2010 Cardiac Athletes had enough money from external donations and from the members’ own fund-raising events and sponsorships to buy our first AED, which was presented to the Emergency Services in Harrisburg, Pennsylvania, USA. We aim to buy more AEDs over the coming years and distribute them around the world. If you would like to contribute to this fund then please Make a Donation. Thank you! Read more about The Pioneers of Cardiac Surgery and Rehabilitation. Read about our Team Achievements.